Nadel Wins, Best Wimbledon Ever? 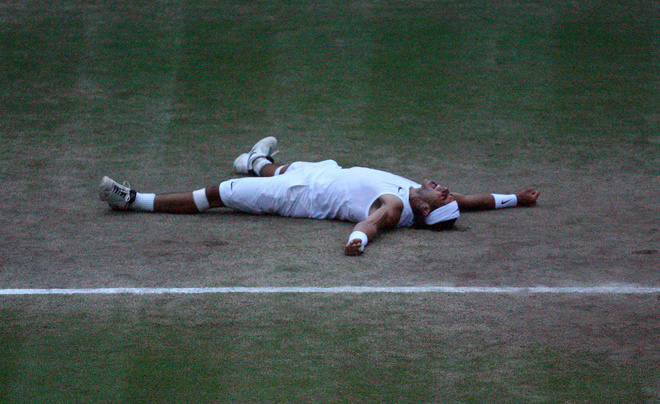 The longest Wimbledon Finals in history did not disappoint. To my readers who watched the epic final, it was one for the ages. To those that missed the Federer/Nadel showdown, it was Tiger Woods at the U.S. Open, Peyton Manning winning a Super Bowl, or Joey Chestnut at the Nathan’s Hot Dog Eating Contest. Wimbledon is a tourney with a 131 year old history, and John McEnroe said it was the best finals he had ever seen. With dark descending on the court, the match finished at 9:16 pm local time, after two rain delays. Federer was shooting for his six consecutive Wimbledon Championship, but settled for Susan Luchi in this one. Nadel won the French Open earlier this season, over Federer and became the first player since Bjorn Borg to win the French Open and Wimbledon in the same season. 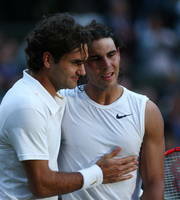 Federer is still waiting on his 12th Grand Slam title and looking to tie Sampras at 14 Slam Titles. Federer came into 2008 hoping to match Pete Sampras’s record of 14 Grand Slam singles titles, but it’ll have to wait for the U.S. Open. It was the best Wimbledon I have ever seen. But to be honest I have not watched that many in their entirety. This one was great nonetheless.